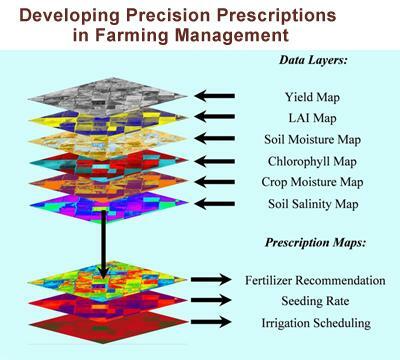 Our goal in model development is to produce novel tools for multiyear grower planning to optimize the use of their resources, and for broader uses, such as regional planning and market projections. Initially, this involves collecting data at three spatial scales in order to create and calibrate models that will help inform orchard management decisions. The smallest scale is at the tree level based on leaf and canopy sampling data. The next scale is based on airborne data with a resolution of less than 1 meter. The largest scale is from satellite images with a resolution of 30 m, encompassing multiple orchards. Current analysis is based on data collected from three airborne over flights and ground data. This includes field spectral and physiological measurements for plant status to link to satellite data. Information is presented for tree scale and orchard scale measurements.